La Isabela is unique in the city. It combines the spaciousness of an apartment with the services of a luxury boutique hotel. It is wonderfully located in the heart of Casco Viejo (the old historic city) with 18th century churches, museums, dozens of restaurants and bars all within a few short blocks. Modern Panama and its business and shopping center are 10 minutes by taxi. We cater to parties of up to five people. Our apartment is a spacious 120 sqm (1200 sq. ft.) with high ceilings (4.5/14ft). The apartment has two bedrooms, two en suite full bathrooms, a large living room and fully equipped kitchen. For your comfort, we provide luxury memory foam mattresses, Egyptian cotton bedsheets, hypoallergenic bamboo and cotton towels, organic toiletries and a pillow menu. The apartment is air conditioned, has high speed WiFi, large flat screen Netflix , Nespresso espresso maker, electric kettle, unlimited organic teas Ipod ready alarm/music player and a smartphone for local use. The apartment has a large front balcony on the street and offers access to a 1300 sq ft (130 sqm) internal courtyard with lounge chairs and outdoor Balinese showers for outdoor dining or simple relaxation. We provide 24/7 concierge services, and daily housekeeping to the highest hygiene standards. We also offer the following personalized in- house services: signature spa massages and services, food shopping service, cooking classes in Central American cuisine, classes in traditional Panamanian folk arts, travel bureau and personalized tour services as well as private chauffeurs for transport from and to the airports and any other transport. The building is an architectural gem. One of the world’s leading restoration architects, Francisco Montanes, and a cutting edge Spanish design group, Bersale, S.A., worked together for almost two years to restore La Isabela to its former elegance. Their vision was to adhere to UNESCO’s World Heritage Site Guidelines and maintain the 19th century elements of La Isabela’s colonial architecture while incorporating touches of cutting edge design. To complement their efforts, selected pieces of Panamanian art are exhibited throughout the building and the apartment. La Isabela – an integration of styles, materials, and perspectives ranging from the 19th to the 21st century. Hello and welcome to our site. We have traveled the world and had the pleasure of staying at some of the finest hotels. We have a wealth of experience regarding what we have liked (and not liked so much). Now that we are retired, we decided to draw on that experience and offer accommodation to other travelers that is difficult to find anywhere else. In so doing, we have tried to provide all the space and comfort of a large apartment with the services of a fine hotel. At the same time, we recognize that you want to choose the nature of your stay, so there is great flexibility to choose what you would like to take advantage. Enjoy! La Isabela is a gorgeous, beautifully restored mid 19th century building. The apartment is a large two bedroom with access to a front balcony so that you can sit and have a coffee and watch the world walk by and to a large internal courtyard to which you can retreat for privacy and quiet. The location on Calle 9 is central (most of what you want to see and do in the historic center is between 3rd and 11th). In addition to large beautifully appointed apartment in wonderfully restored historic building, we offer services that no other VRBO rental does. This includes food shopping service, guided walks, drivers, on-site concierge, in house massage, chef to cook for you, and classes on cooking and folk art. Bathrooms done in cutting edge micro-cement that covers floors, walls and cabinetry. Toiletries are organic, alcohol and paraben free. Large living room with comfortable seating for six. Features large flat screen TV and access to front balcony. Nespress machine for making espresso and electric kettle for tea. Full kitchen with stove, single oven, large refrigerator, all cooking utensils and dishware for six. No Video library but access to Netflix and thousands of online movies free. Front balcony overlooking the street. Looking to the side there is a view of the ocean and the back of the 18th century La Merced Church, oldest in Casco Viejo. Large 1300 sq ft (130 sqm) courtyard with lounge chairs, rocking chairs, fountains and outdoor Balinese showers to cool off. A wonder place to stay. Location and amenities, perfect. The accommodations were better than expected. The location was perfect for the old town touring. The concierge was very helpful and courteous. The room was stocked with dishes and pans. Very close to a nice market. If I had one suggestion, don’t use the car service. The $65 charge plus tip was much higher than Uber who charged $26 to return at high time. We used Uber the entire trip. Much easier than haggling with cabs. All in all, we loved our stay and would definitely use again. This was a very clean and beautiful apartment, with daily cleaning. It was a great location in the old city. Some would say it was a "corporate apartment", so it wasn't really warm, but we were very happy with it. 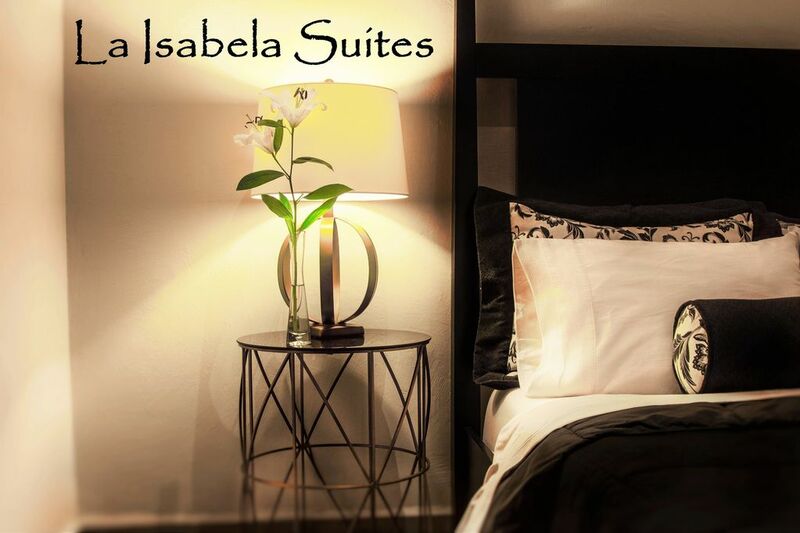 Innovative, interesting and always tastefully appointed and luxurious without being ostentatious, I thoroughly enjoyed my stay at La Isabela. Service was efficient, friendly without being overbearing. Thoroughly enjoyed my stay and the location, you can't beat! I stayed in LA Isabela during a short visit to Panama. At the beginning I did not expect much. And boy was I surprised....we stayed at a great apartment in the best location in the old city. But it was not only the place, an old building restored to a fantastic taste, it was the cleaning standards and the concierge services what impressed us lots. Because we had very little time and it was really a long stop over we asked Alexander the manager to help us to see something. In a matter of no time he organised for us a private chauffeur who took us around the new economic center of Panama, took us to the canal and to a brief guided visit in the jungle. It was amazing. The second day we hired a private tour around the old city and i had a masage in the apartent who fibally took care of my 3 das neck pain!. We also hired the services of the fantastic chef at home the second night. There are a lots of tourist places in Casco to eat but we wanted a better experience. And this chef gave us the best culinary experience we had in our 15 days travels around south America!. The food is supreme but you see him there cooking for you. It is another level really. We left happy beyond expectations. We never expected getting so much from this place! I took the name of the decoration firm who did the restoration because we liked the place and the deco a lot. If in Panama again, we have no doubts about where will we go. To tell you the truth, I thought the pictures were wonderful but I did not what to expect. The apartment was gorgeous and the location was perfect. We walked to everything. It was great to have such a large space for the two of us (we each had our own bedroom) and I loved the micro-cement bathrooms - very cool. The courtyard was beautiful. It was private and quiet. We laid out on the lounge chairs during the afternoon (and yes we used those Balinese showers) and sipped wine in the rocking chairs in the evening. And the services - we splurged. We had the chef cook for us one night. It was amazing - basically a meal from a two star Michelin restaurant whipped up for us in our kitchen. We also had a massage. Divine. My only regret was not knowing this advance and spending a few more nights. Tucked away in the heart of the historic Casco Viejo, a UNESCO world heritage site, La Isabela is within easy strolling distance of art galleries, museums, 17th churches and the Presidential Palace. Some of the finest dining, the best jazz clubs and the liveliest bars in the city are all within a few short blocks. La Isabela is also a mere 25 minutes from the international airport and 10 minutes from Panama’s business center. Hotel Taxes as per Law in Panama (10%) will be collected upon arrival ONLY. In case of cancellation less than 15 days in advance from the date of arrival (no refund), those taxes will not be collected and will not be charged to the guest.